Helmets are indeed the most primary safety equipment for every biker. They do save lot of lives every single year. But, the problem is always for the rescue personnel who are usually the medical assistants. What happens is that when these rescuers come to the spot, it becomes very tough to remove the helmet from the head. In order to prevent this, here comes the solution from Voztec. 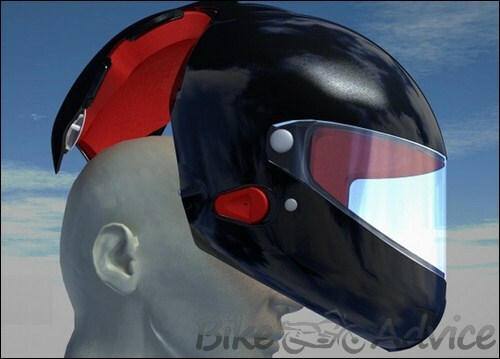 The company has produced a 5th generation prototype motorcycle helmet. The helmet is a full face, rear access, dual locking helmet that has several advantages over and above the current state of the art full face helmets. The mechanics of the system are the subject of a patent application and is referred to as the Voztec Safety Release System, which is in fact a registered technology. Voztec Helmets Pty Limited is wholly owned subsidiary of Voztec Pty Limited, an Australian company and patent holder of a new concept in full face, rear access helmet protection. John Vozzo and Mark Bryant are the inventors of the helmet and together, they are the driving force in the development of the new concept helmet. Voztec commenced the development of a prototype helmet in June 2005. Shape was one of the main considerations whilst developing the Voztec System, extensive studies concluded that the safest shape helmets are the rounder and smoother shape helmets of the early 1990’s. The reason is, the fewer the snag points, the safer the helmet. The current shape and rear access design of the Voztec Helmet has allowed the lower edge of the helmet to be rolled, therefore creating a rounder, smoother, safer shape helmet that fits extremely close to the user’s head, creating less snag points than conventional full face helmets. Countless hours have gone into the development of the current prototype helmet with industry and user feedback being incorporated into further refinements leaving a helmet which is not only revolutionary in design, visually appealing but acceptable to the people that matter most – the end user. The other significant safety advantages Voztec enjoys over its current competition is the emergency safety release system and the fully adjustable chin cup that replaces the old fashion chin strap. Both of these changes have significantly improved the safety of full face helmets firstly by allowing medical personal access if required to the users head in the case of an accident without having to cut the helmet off (especially useful in remote situations) and secondly the new fully adjustable chin cup is not subject to strap creep. Patents have been lodged for the Voztec Safety Release System® in key countries, to secure the technology. The company has also registered a trademark “Voztec” whilst the assembly process remains a trade secret.